If you are a regular reader of this blog, you probably can guess that I did not vote for Ronald Reagan for president. I'm not a fan of a union busting Republican like him. Yet, you have to admit he was a savvy politician. 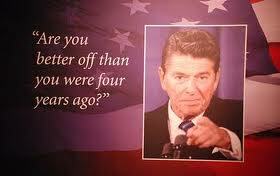 When he asked voters during his presidential debate in 1980 "Are you better off now than you were four years ago?" he struck a chord with voters. It helped turn the tide in his favor. MORE shows its own political savvy by asking the same question of teachers as we approach the UFT elections. The blog post "Are you better off now than you were three years ago? ", the MORE caucus examines Mulgrew's tenure and finds it wanting. In almost every way, from the classroom to the paycheck to the community to the future, Unity has left teachers in a bind. From mayoral control, to a non-existent contract, to charters, to ATRs, to Teacher's Choice (phooey), to support of RttT, to the crappy evaluation deal, MORE lays out all the ways that Mulgrew and his crew have let us down. Read it yourself and ask yourself honestly--ARE you better off now than you were three years ago, when Mulgrew took the helm of the UFT? I know I'm not. My paycheck has shrunk, my job security is about to go up in smoke, my class sizes have grown every year--it's a mess. If you agree, you should at least consider a change, before you literally have nothing left to lose! Reagan has a legacy so distorted by the Conservative idolization of him that we may never have a clear picture of the real man behind the television set beyond the elaborate myth now concocted around him. Did he really rid the world of commie scum? Did destroy or save our economy? Check out my portrait of The Gipper and help me figure it out on my artist’s blog at http://dregstudiosart.blogspot.com/2011/02/happy-100th-gipper.html with some Cold War Hollywood! Another thing that turned the tide in his favor was a deal with Iran to hold onto the hostages until after the election, if I recall. I will grant, though, that the guy had a great speechwriter. ^^^ Yes NYC Ed... That was the good old "October Surprise". I wonder what Unity's October Surprise will be. Maybe they will admit they are wrong and MORE is right and just step aside gracefully.